The congregation of the St. Peter Armenian Church & Youth Ministries in Glendale, CA makes a pilgrimage to St. Mary Armenian Church in Yettem, California. At the invitation of the Rev. Fr. Vartan Archpriest Kasparian, Parish Priest of St. Mary, Fr. Vazken Movsesian offers this sermon – about accepting the pilgrimage as we accept our crosses. Scriptural reference: I John 1:1-10. Sermon preached and recorded LIVE at the St. Mary Armenian Church in Yettem, CA by Fr. Vazken Movsesian on 22 May 2011. John 5:19 is the passage that opens this sermon about Christianity as the New Covenant. Fr. Vazken points to the importance of relationships and laws – just as those that govern the planets and the universe. The Old Covenant ends with a period – nice stories, but they miss the point. The Newness of Christianity points to the light/sun beyond the clouds. Sermon preached and recorded LIVE at the Armenian Church Youth Ministries' Center, Glendale, CA by Fr. Vazken Movsesian on 15 May 2011. Fr. Vazken ties Motherhood and the Motherhood of the Armenian Church. Being Born Again - as Christ requires and as the Apostles understood until today. Begins with announcement about the Fast for Darfur - El Vaquero. 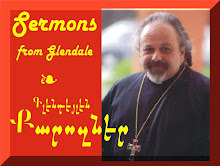 Sermon preached and recorded LIVE at the Armenian Church Youth Ministries' Center, Glendale, CA by Fr. Vazken Movsesian on 8 May 2011. Armenian Language at beginning/English Language sermon begins at minute 13:35.